Preheat the oven to 375°F (190°C). Line a 12-cup muffin pan with liners. Spray the liners with cooking spray. In a large bowl, mix together the bananas, pumpkin, eggs, sugar, and maple syrup. In a medium bowl, mix together the flour, flaxseed, wheat germ, baking powder, baking soda, salt, cardamom, nutmeg, cloves, and cinnamon. Gently stir the wet ingredients into the dry. Do not over mix. Stir in the chocolate chunks, if using (silly not to!). Use a ⅓-cup measure to fill the muffin liners (you’ll have a bit of batter left over). 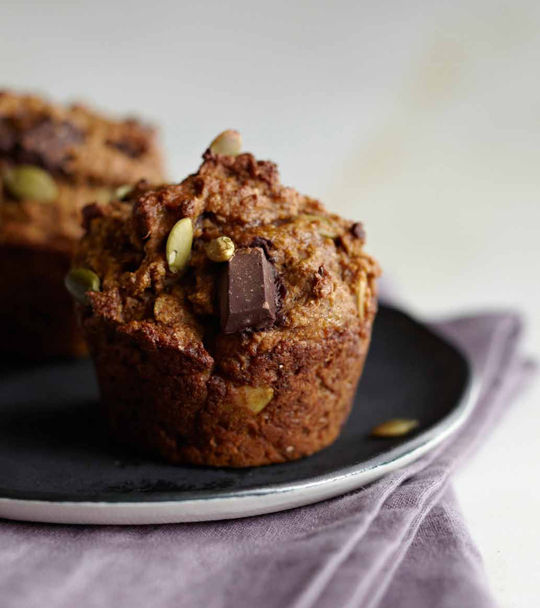 Sprinkle the pumpkin seeds evenly over muffins. Bake for 20 minutes, until the tops feel dry when touched. Transfer the muffins to a baking rack to cool.